Our options – We bring more resources to the table. We work for you! Some of the products we offer cannot be made by local sign companies, such as franchise-quality lighted signs of the type that Taco Bell, Pizza Hut, and Harley Davidson use. We use onsite computer equipment to lay out your sign’s design(s). 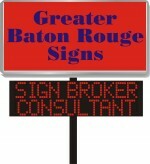 We provide suggestions to maximize the effectiveness of your sign. Do you have a logo or layout that “brands” your business? We can reproduce it! Consultation of what works best when it comes to advertising. Marketing vs. identifying! Most of our lighted sign products can be produced in 3 to 4 weeks, unlike the common 6+ weeks it takes by local sign companies. Other products can usually be produced in 2 weeks or less. You take advantage of discounted prices because we buy at wholesale and have low overhead.